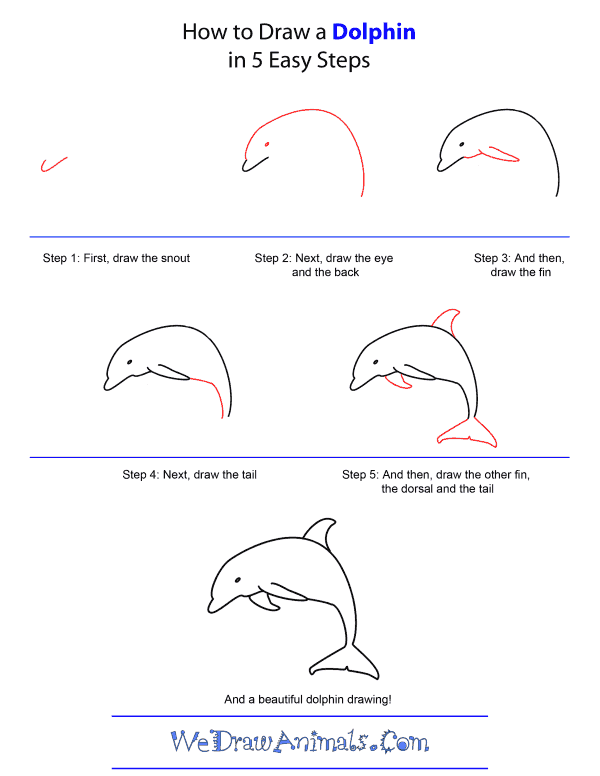 In this quick tutorial you'll learn how to draw a Dolphin in 5 easy steps - great for kids and novice artists. At the bottom you can read some interesting facts about the Dolphin. 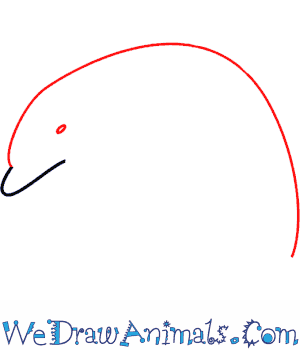 Step 1: First draw the snout. 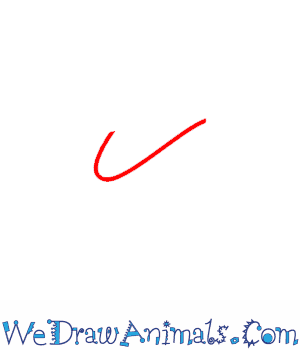 It is a crooked "J" or a hook shape. Step 2: Just above the top of the long line of the hook add a very small dot for the eye. Starting at the short curve of the "J" draw a very large curved line for the back. Think of a big backward "C". Step 3: Just behind the eye add a short line to make the neck line. At the end of the neck line add a long, thin "V" shaped fin. The fin will angle back towards the back line. Step 4: From the tip of the fin draw the tail line toward the back line and then curve sharply down. Make the bottom almost touch the back line. Step 5: Below the neck line add another pointy side fin. 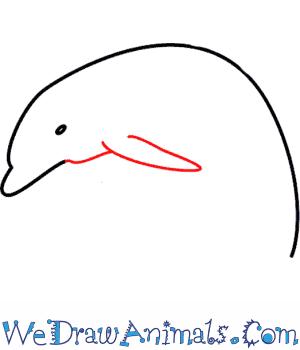 On the top of the back add a pointy dorsal fin with two lines curving to the left side. Finish your dolphin with the big triangle-shaped tail at the bottom of the tail line. Dolphins live in groups called pods with about 12 dolphins. 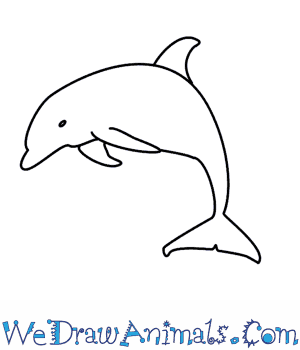 The most common and well-known dolphin is the bottlenose dolphin. The largest dolphin is the orca, or killer whale. Dolphins eat many different fish, like mackerel and cod. They also eat squid. Dolphins have one stomach for storing food, and another stomach for digesting food. Killer whales go for larger prey, like sea lions and seals. Dolphins can dive as deep as 1,000 feet underwater. They can jump above water as high as 20 feet. Dolphins are mammals. Their average lifespan is 12 years. Some have been known to live to be 50 years old. Dolphins can swim as fast as 25 miles per hour. They jump in and out of water to move at a faster pace. 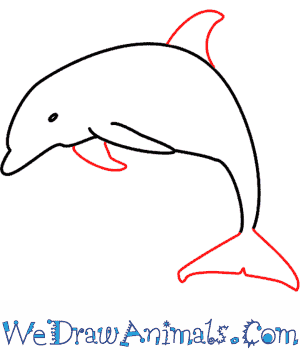 Dolphins find food by using echolocation. They make a clicking sound, and like an echo, the sound bounces back to them. That is how they know the size and how far away an object is. Most dolphin species live in the ocean, while a few live in rivers. Dolphins whistle to communicate. The eyes on the sides of their heads allow them to see forward, to the side, and even behind them.